BAM Pest Control was founded in Katy Texas with a service philosophy to deliver prompt, personalized pest control utilizing the latest pest control strategies and methods. We know perform pest control in Pearland, Houston, Katy, Sugarland, Cypress and the surrounding areas. We employ pest control and animal control methods that reduce the traditional impact in your home or office. We are committed to delivering professional customer service and a superior work product. Our team of pest management professionals receives rigorous training and is licensed by the Texas Department of Agriculture. Our management staff is also trained by the Food Industry Sanitation Auditors (FISA) and American Institute of Baking (AIB) to solve pest issues in food handling areas. You can rest assured that all of your pest management needs will be exceeded by our highly trained commercial pest management technicians and experts. Kevin Rooney brings more than 15 years of Residential and Commercial Pest Control experience to BAM. 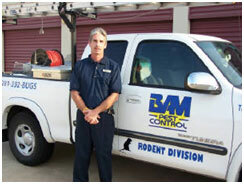 He specializes in large and small rodent trapping, Rodent Exclusions, including reptile and bird proofing. His years of termite experience include Barrier Treatments, Baiting Systems, Heat Treatments, Foaming, Fumigations-Tenting, Spot Treatments, etc. He has been employed in a supervisory capacity at BAM for 6 years. We have an in-house recycling program that recycles all cardboard, white paper and plastic.